We visit Salbris to do some shopping. I’m particularly anxious to buy some anti-woodworm product to treat the beams in the bedroom; if you tap them, you’re rewarded with a cloud of dust. Fortunately they’re oak and very thick, so any damage should only be superficial. Still, it’s worth making sure that any woodworm remaining are dead ones. I was able to purchase some stuff containing Fipronil; strangely enough it’s the same stuff used against ticks and fleas for the cat. Hmm. I wonder which is cheaper? (Only kidding). Our first night in our new home! I hate waiting. If I ever have to be somewhere, I’m always at least 10 minutes early. If someone is coming to visit me at a certain time, I’m always on tenterhooks from about 20 minutes beforehand. So today is not a good day; the furniture is due to arrive. Sort of around lunchtime. Maybe. LSS busied herself vacuuming the walls and ceilings in both rooms; the spiders had been doing their own decorating in both these rooms. At this point we discover that the mobile phone reception at the property is – practically – nil. I finally manage to get a signal by moving into the middle of a field, and standing on one leg, with the phone held horizontally. The missed calls were from the driver of the removals lorry to say they have stopped to have lunch and should be with us by 1 p.m.
At around 1.15, the mobile phone rings again and then gives up as soon as I answer the call. After lots of manoeuvring, I finally manage to understand that it’s the driver of the removals lorry again, saying he’s uncertain of where exactly the property is. I had compiled a detailed map and emailed this to the office with the credit card details – but – of course, this information had not been given to the driver. I ended up taking the car to the junction with the main road and dashing out into the middle of the road as soon as I saw a lorry appearing. The first three were very surprised, having nothing to do with furniture deliveries at all. But finally the lorry was parked at the entrance to the barn, and unloading could commence. Everything was finally in place and we waved goodbye to the crew at around 4 p.m. Another telephone call was then received by LSS; the aged FIL is being released from hospital on the 29th; so it’s time to vacate his premises and move the cat to her proper home, namely, here! 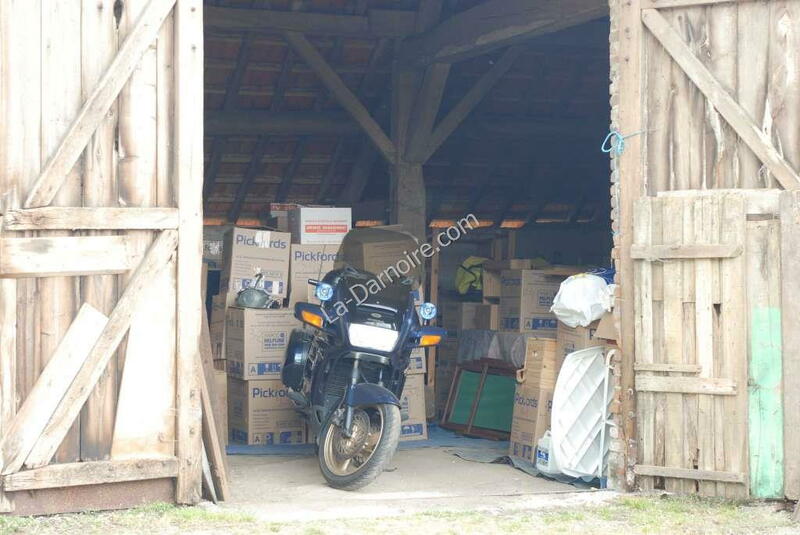 The barn containing all the packing boxes, furniture, and the ST1100. Following our board meeting, it has been decided that the wood which is currently residing in one of the outhouses will contribute to the fuel supply for the wood stove. It’s full of woodworm so basically can’t be used for anything else. There was a wardrobe in the bedroom which we were hoping to use, but as we tried to move it, it fell apart. Oops. Oh well. There are quite a few old wooden chairs as well; the woodworm (or possibly termites, not too sure which) have had a field day on these too – but have been very particular to only eat the bottom of ONE of the legs on each chair. Very odd indeed. The chairs feed the wood stove too, because we become tired of having to place a brick under one leg of each chair. The bedroom and lounge are finally empty of junk, and we’re able to get our first view of the lounge walls; the plaster is coming away in sheets so that’s yet another job for the to-do list. Tired, dirty but happy, we retire to the other house and have another well-deserved wash in the open-air bathroom. We’ve decided to take Sundays off; with the amount of work which needs to be done we’re going to need one day a week free of renovating! We visited the aged FIL in hospital; he was his normal crotchety self. The water in the bath which we left in the garden all day today didn’t heat up very much. It hadn’t collected too many drowned insects either, which was a pleasant surprise. But I did have another cunning plan. In our possession is a black plastic 20-litre jerrycan. This was filled with water and also left in full sunshine. It heated up its contents quite nicely, which meant we only needed to boil two kettles on the gas stove in order to have a hot bath. Despite getting to bed in the small hours, we got up early to empty the car. Then we did a bit of food shopping in the closest large town, Lamotte Beuvron. It was now time to visit our new residence. The plan is that when all our furniture arrives, it will be stored in the barn until such time as we have renovated the existing rooms. Ah, yes, but that means the barn needs to be empty first! Unfortunately the aged FIL is a hoarder. Nothing (absolutely nothing) gets thrown away. We decide that one of the outbuildings (seems to have been a rabbit pen at one stage) will be used for all the scrap metal. Another outbuilding (was the residence of a very surprised barn owl) will house all the bits of wood until such time as we can decide what to do with it all. Underneath the pile of junk lurked something large and heavy-looking. It was a horse-drawn cart. LSS and I managed to drag it out of the barn without dismantling too many walls on the way, and parked it next to a field. Maybe we’ll sell it on Ebay. “Offered for auction: horse-drawn cart. One previous lady owner. Genuine French woodworm supplied free of charge.” Or maybe not. It may just fall apart on its own. With the barn finally empty we level the dirt floor, filling in the larger rabbit holes, and cover the soil with a couple of large tarpaulins, ready for our furniture which is due to arrive next Tuesday. Upon returning to the aged FIL’s house, I spied a couple of old bathtubs in a field. They had originally been used for watering cattle. We took a closer look and managed to find one in fairly good condition. We cleaned off the worst of the rust and set it up in the middle of the garden. 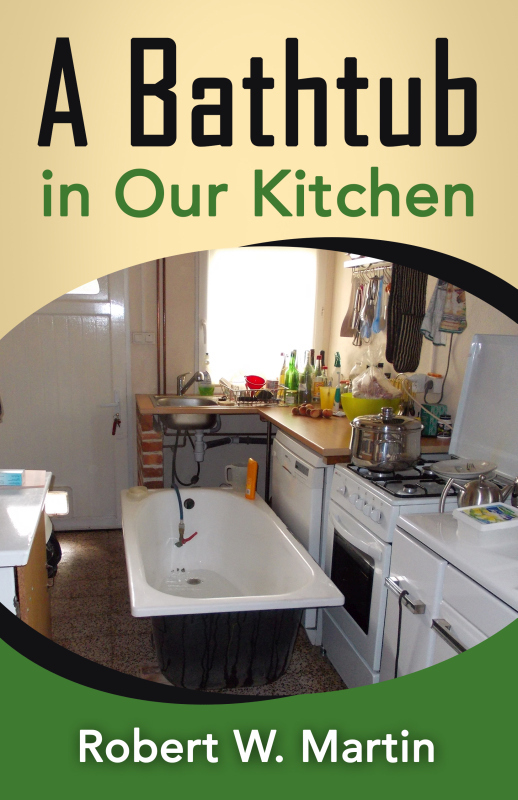 LSS whittled a bathplug out of a large cork and voila – an open-air bathroom! We heated some water on the gas stove and managed to rinse off all the woodworm dust. LSS had the brilliant idea of taking a photograph of me enjoying a bath au naturel in more ways than one; fortunately the camera battery had gone flat. Some slight improvements are needed here; we need a bit more water! 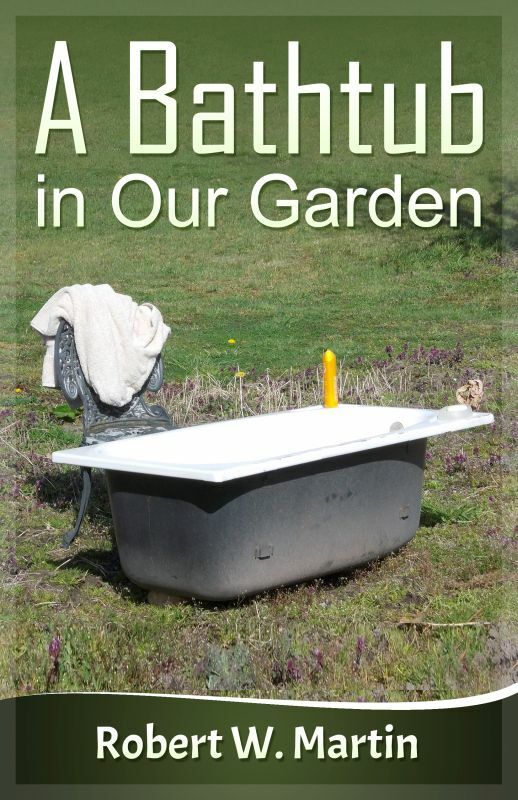 The bath is emptied by the simple expedient of turning it on its side – oh, weren’t the earthworms surprised! We then added about 20 litres of water to the tub; it will be left in the sunshine all day tomorrow to warm up. 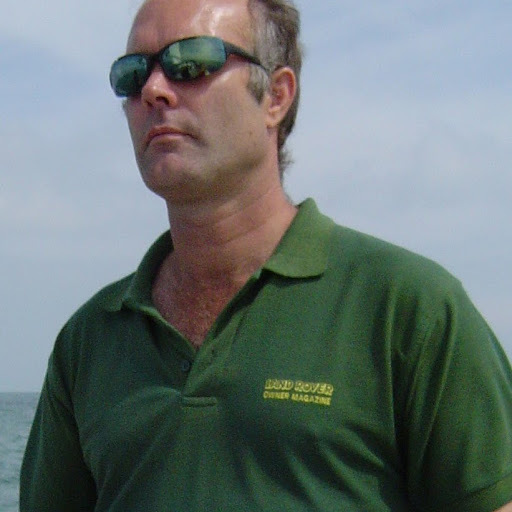 I suppose the first post in a blog should be an indication of what the blog is all about. That seems a fairly simple idea. However, sometimes it’s not that easy without going into lots of details, so I’ll summarize matters and just say that we had been trying to sell our house in the UK for over 8 months before it finally sold. My wife (hereafter called “LSS” for Long-Suffering-Spouse) is French, and her father (hereafter called the aged FIL for Father-In-Law) was living on a derelict farm in the middle of France. (D) lavatory is at the furthest end of the house, outside. It’s simply a hole in the ground, covered by a bench with a plastic toilet seat. It does have rough wooden walls and a corrugated iron roof. You don’t want to spend too much time in there, especially in winter, because it’s extremely draughty. As regards personal hygiene, what’s that? If you want to wash, use (C) above. The property itself is around 30 hectares in size. It’s shaped like a large letter “W”, with two houses, one at either end of the “W”, a kilometre apart from one another. They stopped farming here about a decade ago, and the land has been returning to its natural flora, namely mixed woodland. The soil isn’t much good for growing anything else, if I’m honest. The house in which we were going to live is called “La Darnoire”. In the patois of the region, this literally translates as “La Terre Noire” or “the black earth”. Because it is. The house itself has been empty for some 30 years. There is an electricity supply. And a well. And that’s it. No bathroom. No telephone. No running water. It’s even more basic than the aged FIL’s house mentioned above. With a couple of small advantages though; the roof doesn’t leak, and the walls are more solid. So we have lots to do in order to transform the living accommodation into something a bit more modern. We’d like to do this as ecologically as possible but using modern methods. However, the entire principle of the project is to renovate the property by using as little money as possible, for the simple reason that selling a house during a recession generally means the amount of money left over is extremely limited! And at the same time we intend to be as self-sufficient as we can be, growing our own food etc. As far as earning a living, LSS is completely bilingual in French and English, so one plan of attack is in utilising these skills in translation, and assisting businesses that would be interested in opening branches in the UK. As for me, I have several websites which bring in a little income, and my second plan is to write a book about the renovation process. Where was I? Oh yes, the house had finally sold. The aged FIL was in hospital, so we decided to start off by staying in his house until such time as we could make the other property livable – more on that later. We left the UK around lunchtime; myself on the ST1100 motorcycle, and LSS in her car with the cat as a travelling companion. We took it easy, stopping for a break every hour or so and using the back roads in order to avoid motorway tolls. We finally arrived at around 1 in the morning, and the only one who was not tired from the trip was the cat.